Do You Have Any Fun Food Rules? Whether they are funny, serious or silly, I’d love to hear some of the fun “food rules” that you may intentionally, or unintentionally, live out in your home, around the dinner table, or in the kitchen. There is no such thing as too much garlic or onions when cooking. Grilled Cheese and Tomato soup must always be eaten together. A chocolate cookie in each hand really evens out the calories. Don’t answer the phone during dinner – everyone needs to totally unplug. Dinner by candlelight is a necessity. If you dirty it, you clean it…put the dishes in the dishwasher, or wash it after you are done. Now I’m off to be inspired by these hundred tried and true recipes. With fall scheduling here, my meal plan strategy needs to take it up a notch. Also, link back here so that everyone can join in the fun, it’s just common courtesy of blog carnivals. Please do not link up a recipe meme that you have started. Thanks for your understanding. My mother always says you have to eat two Krispy Kreme donuts at a time – one for each hip! One of our kids is considerably underweight (recovering from leukemia, not genetically). Our rule is if we eat one he has to eat two. Sometimes we even all have to watch as he eats THREE! Can you believe the kid does not eat chocolate?!? So, when it’s time for dessert he eats none and we all get to share his portion! We think we all win! a) You CAN eat only the top of the muffin, for that’s the BEST part. b) Always add more chocolate chips than the chocolate chip cookie recipe calls for. c) Always use a cutting board, rather than cutting on the kitchen counter. Our kitchen counter is 22 years old and looks the same as the day it was put in. (I know, that may be longer than some of you are old!) 🙂 But you also have to have several cutting boards available to make this work. i shared mY instructions for dehydrating tomatoes and an article I hope fits in! Probably the “rule” that gets the most raised eyebrows in our family is that once you turn 13 you can have coffee, before that you can only have coffee on New Years morning. BUT… we don’t drink sodas and we mix decaf and real coffee. But I still get lectured about how caffine stunts growth – my 17yo and 15yo are both almost 6 feet tall! Thanks for hosting. I can’t wait to read everyone else’s “rules”. If I cook my husband cleans up! It has been a rule since I grew up the cook always got out of cleaning. 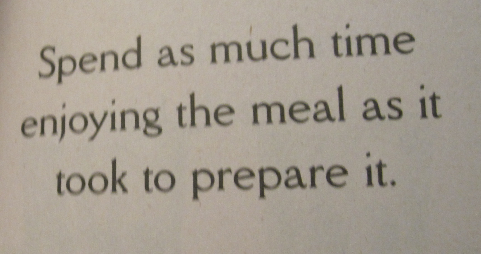 I think in our house, we would have to change that rule in the picture to ‘spend TWICE as much time enjoying the meal as it took to prepare it’. It is so hot here in Texas, I have been making quick dinners that involve little to no cooking! We always eatdinner at the table as a family. The cooking rule in our house is that the person that cooks does not clean up. I cook he cleans. He cooks I clean. 1. Seriously. There is no such thing as too much butter. 1b. Or sour cream. Or cheese…. In our house, we hardly ever have weeknight food on the weekends. You’ll hear, “oh, no, that’s a Tuesday night meal” frequently around here. And we all know exactly what that means. I never thought about how many ‘food rules’ we have but there are quite a few – beginning with NEVER chew with your mouth open or talk with food in your mouth. Those are absolutes. It’s just gross and poor manners to boot! I’ve always been astounded to observe ladies and gentlemen dressed well and in a ‘nicer’ restaurant chewing and talking with their mouths full – it totally spoils the ‘look’. ‘Four on the floor’ is another table rule since we’ve had too many tip overs to count – now all four chair legs must be on the floor at all times. We’ve always done the ‘Thank-you bite’ and it’s really expanded our children’s food preferences and helped to cultivate a heart of thankfulness for the bounty our table holds each meal. We eat together no matter what – at the table 6 out of 7 nights – in front of a video once a week. At the end of every meal together the children pay a compliment to the cook, thanking my hubby or I for preparing the meal and telling one thing that they especially enjoyed. When they do this at other people’s homes our hostess is often very pleasantly surprised, though at one meal it really backfired! We were at a friend’s house and she served a spicy lasagna full of ‘strange veggies’ that our son had a hard time eating. At the end of the meal all he could find to be thankful for was a really cold glass of water so his compliment went ‘Thank you for preparing supper for us. My favorite part was the nice cold glass of water.’ He was 6 at the time so all was forgiven. @Heather, We tell our kids they have to have at least three chair legs on the floor at all times… Now wait while your kids spend a minute trying to figure out whether or not it’s possible to have only one chair leg off the floor. It’s a funny moment, and anytime after that, when we say, three legs on the floor at all times, it makes our kids smile, but the silliness helps them remember the rule! Even if you’re not hungry, you have to sit up with the family. No texting at the table. If you don’t like what’s being served, make yourself something else. It must be ready at the same time as the family’s meal. 2) No phones or texting. We have caller ID on the house phone, and occasionally, we will answer it if it’s a business call (we are farmers, and a lot of our “phone business” gets done in the evenings). 3)My kids are old enough that they don’t really need a lot of encouragement to eat their veggies, even though they don’t always love them. Daughter #1 hates cheese (no idea how I got her), and Daughter #2 won’t eat asparagus. Not too bad, so I don’t force the issue. 3) And the usual manners stuff really matters to me — sit up straight, napkin in lap, chew with mouth closed, etc. We DO allow — singing (to my mother’s abiding horror, but sometimes you just need to share something), and the computer gets whipped out a few times a week when dinner conversation veers into territory where we just have to Google something to check a fact. My husband grew up in a home where you had to clean your plate… so when my kids were little he tried to enforce the same rule at our table (more on this later!). When my daughter was three she was desperately trying to finish her dinner and finally just stopped…and proclaimed “If I eat another bite of food I’m going to over-blast!” We all had the laugh of our life that night! This all being said…this could have possibly been the downfall of a wonderful marriage (going on 23 years now! ), it created so much stress in our home…all of you newlyweds or not yet weds…this should definitely be one of those conversations to have with your spouse BEFORE having kids!!!! Thankfully, after the over-blast comedy event, my husband and I were able to come to an amicable agreement on the clean plate club!!! Not so much a family rule but a rule I gave each of my sons when they married: Never, ever, because your Mama will hurt you when she finds out, tell your wife “That’s not the way Mom made it.”. Only one son has said it so far & he only said it once. There’s no such thing as too much garlic and onion? Ohhhh, yeah! Definitely! The one rule I have is: You don’t have to like, but you do have to eat it. Without complaint. The only other “rule” I can’t think of is that you just can’t have pizza without coke. -there can never be too much butter on your bread. Mummy eats the same as her daughter, after said daughter has made her choice of sandwich. Otherwise, daughter will stop eating whatever she chose, and finish mummy’s sandwich. My mom had some great advice – when out at a restaurant and you are beginning to fill full, focus on finishing the most expensive part of your meal. That way you get your money’s worth. For example, filling up on a lobster meal? Stop eating the corn on the cob, and enjoy more of the lobster! It’s a great tip! 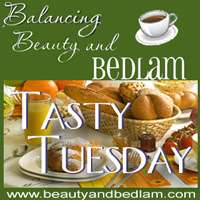 Thanks also for the Tasty Tuesday recipe exchange…I am sharing a zucchini bread that has no refined sugars. Have a wonderful day! HA! I love the food rules. I never realized but we Do have some, too. The grilled cheese & tomato soup is a given 🙂 I’ll be thinking about our “unspoken food rules” all day. Ha ha…thanks Jen!